Anthony Martial and Paul Pogba combined well to give Man United a 3-0 lead in their Champions League opener against Young Boys this evening. Pogba, who’s already scored twice so far in the match, added an assist to his match stats, as his pass set Martial through, who finished well to put the away side in a commanding lead. Pogba has been sensational for United this evening, and his return of two goals and an assist doesn’t do his performance justice. 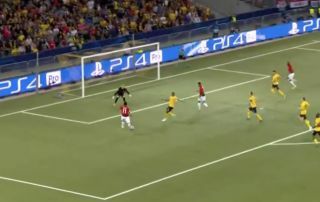 Here’s a clip of Martial’s goal, one that United fans will have loved to see him score, and his first for United in quite a while.